A trip down The Elbe River - Organised by Dutchman Willem Leopold (of boat Grundel Huibertje). Probable dates 25th May to 8th June 2013. The following is extracted from Willem's email of 27/12/12. "It will be an adventure." "We will go somewhere between May 25 and June 20 when most people can join." "... we will need around 11 days to sail from Stadt Wehlen (Km pole 26) to Magdeburg (Km pole 322), but as the river Elbe is a melt/rain river there is always the uncertainly of the waterlevel." "All the ships will be necessarily self supporting. There is no 'In Dubio' (hotel barge - PW) for our comfort. We will have to sort out our own sleeping arrangements, in our boats or tents. We will also have to do our own cooking or eat outdoors sometimes." "The lowest bridge is 5 mtr. and non movable." "The maximum will be around ten boats, since there will only be small harbours along the way." "After January 15 we will decide the best period. If you are still interested please send me your favorite 14 days in the above mentioned period." "Should you come with your own ship or do you want to sail with someone else?" "From England also Geoff Probert is interested." Willem would like feedback by mid January with expressions of interest so that he can plan accordingly. See map below for where it is. "Cruising on the Elbe is substantially different than the Kralingse Plas. There is a current of ± 5 km per hour, varying with rainfall upstream. "If you have to stop and you have to anchor, no inhibition present work. Because you probably are not (able to row) against the current you (must be) constantly vigilant that you do not miss scheduled port or node comes with a flying bridge. " "In our view, it is advisable to at least two people in a boat to sail. So a good physical and mental preparation is indispensable! " There are enough ports for day trips between 30-40 km. Almost anywhere can be camped. Sometimes we can even spend the night in a clubhouse. Near places like most about are also shops, small hotels and bed and breakfast options / Restaurants. The people we met were all very friendly and helpful. There is little commercial. Much less than with us on the Gelderland IJssel. There are many motor boats, canoes many societies and are sometimes held regattas. " "And of course using Google Earth w here you can click on many photos. (These pictures are usually taken incidentally in beautiful weather. Unfortunately, that is not always available!) "
There may be up to 10 boats in our view it. This is because of the capacity of the mostly small harbors. 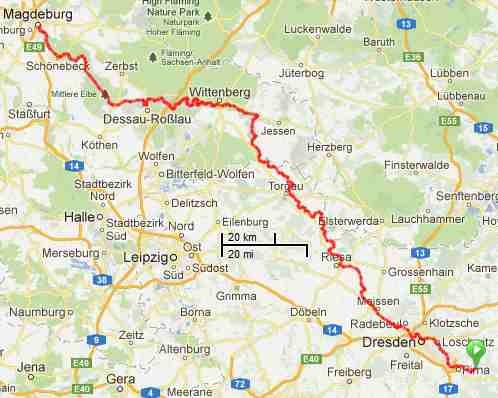 Through Dresden, Coswig, Meissen, Riesa, Belgern, Wittenberg, Dessau to Magdeburg (kilometer post 322). "The best time is late May, early June. Excluding return trip, we need at least 11 days. Assuming 30-40 km per day. If we decide to visit a few cities, the period should be longer or shorter trip. Very likely drive the wife of Jelle along with a camper. They can then luggage (tents and sleeping gear) to take us. " "If we're going to have clear agreements with harbourmasters etc. I make a detailed road map with bridge heights, slurry vats, obstacles, etc. We try with all participants "introductory meeting" to organize details etc. to discuss. " "In connection with preparations beginning in January 2013, we would like to know who is seriously interested". Henley Whalers please reply via GP or PW. Molly probably not going but Whalers welcome to join up.